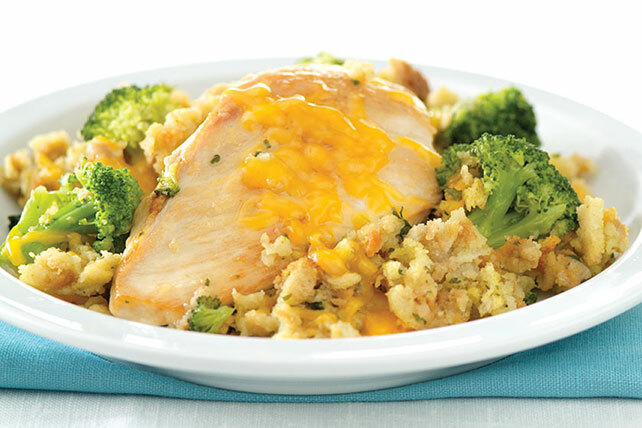 Thanks to quick-cooking chicken breasts, stuffing mix and frozen broccoli, this sizzling skillet can be ready to serve in just 25 minutes. Cook chicken in hot oil in large skillet on medium-high heat for 6 minutes on each side or until chicken is cooked through. Remove chicken from skillet; cover to keep warm. Add water and broccoli to skillet; bring to boil. Add stuffing mix; stir just until moistened. Return chicken to skillet; sprinkle with cheese. Reduce heat to low; cover. Cook 5 minutes or until cheese is melted.